Rodinia was a Neoproterozoic supercontinent that began to form roughly 1.3 Ga during the Grenville Orogeny. The configuration of Rodinia has been hypothetically reconstructed based upon paleomagnetic data and the mountain chains (orange) formed by the Grenville orogeny, which span several modern continents. 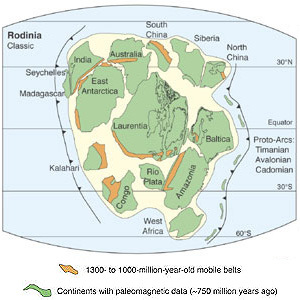 Rodinia probably existed as a single continent from 1 billion years ago until it began to rift into eight smaller continents about 800 million years ago.